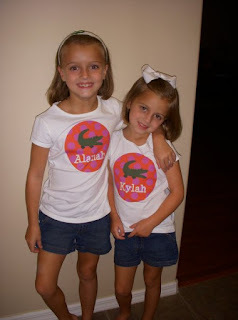 I can't believe I have taken so long to blog about our newest and most adorable product - Preppy Tees (they have their own category on the web site now, check it out!). They are simply the softest tees with the most adorable designs - they make great gifts for birthdays, family gatherings, group outings, to commemorate a special event, or, just because your kids love tees and you love monograms! We really like working with people to come up with the perfect design for their special tee - you might say its our specialty (get it??? yeah, I know, I'm not that funny!). Please note, all of the designs on the Preppy In Paradise website are copyrighted - so for those of you who are looking to coast off of our hard work (and we ALL know who you are) please don't! Its wrong, its illegal, and its distasteful - oh, and one of the benefits of having attended law school, is that I have law school buddies just itching to go after design thieves!